This forum thread is now closed. Thank you to Dani and everyone who posted a question! This is our Ask Me Anything event with Dani Avitz, an industry veteran and former owner of iCommerce - a global ecommerce agency helping online retailers with every aspect of their business from marketing and marketplaces to branding and logistics. 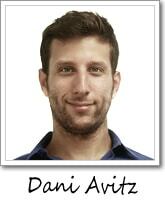 Dani is now the Co-Founder and COO of Algopix, an automated product research platform for eBay & Amazon sellers. We would love it if you can submit your questions in advance to questions@webretailer.com, or on the day by posting on this thread. Sales channels from eBay and Amazon to Jet, Sears, Walmart, Rakuten and more. Listing optimization to improve search ranking and conversions. Pricing - choosing a repricing tool, and the main strategies and pitfalls. Inventory management and issues such as overstock and supplier negotiations. Logistics including 3PLs and dropshipping. Please include some background information about your business such as how long you have been selling online and the kind of products you sell. Questions and answers will be posted on this forum thread, which will be open throughout the day on Wednesday 2nd May. I sell online but have not been in profit for 12 months due to overhead. I would like to understand which methods meaning private label, wholesale or other is most beneficial and streamlined. Is a warehouse needed to be successful in this business as a reseller? Private label, wholesale and dropshipping are different types of eCommerce businesses. With dropshipping, you don’t keep your own inventory but your margins will stay rather low. On the other hand, you’re not exposed to finance and inventory maintenance costs. Also, you will always have to go back-2-back with your suppliers. If you choose the wrong supplier, this could potentially damage your account and reputation. The private label method requires you to understand the entire supply chain, work with a manufacturer (mainly Chinese) and invest in branding. On the other hand, you create value. You are valued for your branding, your customer service and of course - the product you provide. For private label, the margins are usually higher. Wholesale is a different scenario. You don’t have to invest in branding, but you do have to make efforts in finding the right suppliers and products and make sure you purchase your products at the right price. You need to compete in pricing, make sure that your product stays relevant in the near future and that you are not infringing on copyright (i.e. Vero). All of the above is just the beginning. Every method is a business in itself, and like any business - the basics must be learned in a comprehensive and professional way. As for warehouses: If you choose the dropshipping model, you don’t need one since you’re not going to keep inventory. If you choose private label or wholesale, you do need a warehouse. PROS: You control your inventory and logistics. You guarantee that the customers get their packages in time and you have a better position on the whole supply chain. You manage your own staff and are in charge of the whole process. CONS: It’s time-consuming and expensive. You will need to hire extra staff as you grow, provide a software system, comply with regulations and provide maintenance to the place and machinery. When something goes wrong, you have to deal with it yourself and can financially and practically not rely on the third party. PROS: You don’t have to hire employees and pay for rent. Usually comes with integration. There is no maintenance cost and you basically also outsource the issues that come with the logistics. CONS: You have no control over the supply chain when the products get shipped, you pay more for every component. You can’t do your own quality checks and therefore not improve service where needed. PROS: Amazon is responsible for fulfillment. You know you’re in good hands when you work with Amazon FBA. Fast shipments, Amazon promotes your products, you are covered when customers say they didn’t get the product. Chances are higher that you can offer lower prices or free shipping. CONS: If you would like to ship to other platforms, such as eBay, you will pay more. If you store your products on Amazon’s fulfillment center in the US, you will be able to ship to the US. International shipping is more complicated. As for your online selling, you are subject to possible price wars with other sellers of the same ASINs. As for overhead, your goal as a merchant is to offer a competitive price and still keep decent margins. You’ll want to take into account the overhead of purchasing/manufacturing. This means predicting various expenses such as customer service, returns & refunds, shipping, and taxes. Also, are you going to pay for DDP or will your customers? There is also a possible decrease in the price of goods, logistics, including pick & pack. I highly recommend working with an excel spreadsheet. Have everything in front of you, try to predict the different situations that may occur. I been scratching my head many times while I was researching blogs about ecommerce. I figured out that a niche is a big but of online business so i started researching on how to choose a perfect niche. Some blogs say you must choose a niche that is popular because there is profit potential while others inform to avoid the popular niche because of competition and go for inchies that have average market. I'm really stuck here. I know a niche is a big part of business. Leonard Cohen once said he thinks there is a niche for every market. Boy, he was right! Like with every business, I think you should run an eCommerce business in which you provide added value to your customers. Whether it’s your knowledge, your prices or your customer service. This is, in my opinion, the heart of a good and stable business. I agree that finding a niche is very important. It allows you to dig deep into your market and understand it fully. You can control your prices and offer amazing customer service with your added value. If you’re a jewelry expert, you can give your customers great advice, right? You also have a homogeneous user database so, it will be easy for you to establish a great community. With a community, you continue to learn and grow with the niche. This way you can keep offering the right added value. I recommend choosing a niche that you personally feel connected with. Go with your own interest and passion, this will make it easier to find the right sources and provide the genuineness that buyers are looking for online. When it comes to competition, you will always have it. Going against a strong competitor is not necessarily impossible. Be prepared to spend time. Growing an audience works by building trust and providing deep valuable information in your descriptions, videos etc. If you do that, out of a personal interest and passion, you will automatically be a great source to buy from, regardless of what your competitors do. If you choose a highly competitive niche, then the bloggers are right, there is a big potential for these products but also consider the pricing and cost of your products. Beauty products compared to led lights for cannabis farms for example. It’s really a choice that you need to make for yourself and there is no right or wrong answer. It’s mainly your gut telling you want you to feel like going with and therefore following your passion for a certain niche that you belong to yourself or are closely related to. How does one determine the best products to consider selling online? I currently do not have an online selling business but I am considering it. At this juncture, the issue is trying to determine the best product to sell. I have heard of utilizing Unicorn Smasher and the other similar database to compare products, but trying to pin down the right product is the barrier to entry for me as I do not know how to do it. When I do locate a product that looks interesting the market is already saturated with others selling that same product. I do have a patent that is in patent pending status that I would like to try and sell online. I do not know where to start with this. Can you direct me to someone that can help me with how to get a new invention online to sell? When it comes to analysing tools for which products to sell, where, and at what price - there are several leaders on the market. Our solution, Algopix, which allows you to analyze both a single product and multiple products at the same time (7 states of eBay and 7 states of Amazon). This includes details of anticipated expenses, logistics costs and level of demand in each market. In a few weeks, a new feature will be introduced that provides the total sales of each product in the various marketplaces. As for your second question, I understand you are in the process of patenting a certain product that you want to sell online. You can do it by yourself, hire a freelancer or employee or work with an agency. An agency can give you a complete answer to all your needs. As a former owner of such an agency, I know the values ? ?of a good agency. I recommend this last option strongly. If you contact me with a detailed response, I’d be happy to recommend a trustworthy company that I have good experience with. I have a couple of questions regarding eBay selling. I am drop-shipping on eBay, although I have a separate eBay store in which I sell collectable maps and have done for many years. The drop-shipping is a new venture and I am running it totally cleanly (unlike some) and using approved DS sources, mainly in furniture and home decor. 1. Some folks in my group say that you should put in your description three or four keywords from your title in description three times - once in bold, once in italics and once underlined. They even repeat the title in their descriptions. I thought this was now redundant and generally regarded as "cheesy and "spammy" - comments on this would be helpful. It has become contentious. 2. EANs are now regarded as very important on eBay as they head towards the "catalogue" and "buy box" format. Is there any benefit in buying your own EANs for items or is it better to go with the original EAN even though you might be more expensive (especially as a drop-shipper)? Thanks for your questions. I'll try to answer accordingly. Just like with Google and Amazon, no one really knows how the algorithm of eBay's search engine really works. However, there are some tips that I can give based on logic, SEO practices and some experience that I gained over the years. There is no doubt that the product description is important. It not only gives the buyer important info about the product, it can also reduce the return rate sometimes and helps in promoting organic search in the marketplace. However, I have never heard of keyword formatting (bold, italics and underlined) having an effect on the search results. Design sometimes has an impact on the organic traffic (SEO) on private websites, so maybe these folks conclude that this is the same within eBay. There probably isn’t only one answer to your question, but in my opinion, using an existing EAN can help if your price is competitive. This because you might get more traffic to the product pages. The best way to test this is to do A/B Testing. For example, if you have 500 products, you will list 250 products with the original EAN and 250 products with the EAN you purchased. After a while see if there is a significant gap in the results. Of course, you have to promote them in a similar way. How do I get my products to appear on the first few pages in a search? You’ve hit the Million Dollar question (literally!). Amazon’s search engine algorithm (which is called Amazon A9) is changing all the time, and nobody really knows how it works - exactly like Google’s algorithm. Having said that, during the last couple of years I helped many Amazon merchants to sell their products (both wholesalers and manufacturers) - so I’m going to share my experience on this matter. List only products you think you can sell. Jeff Bezos always says he puts the customer at the first place. This is why I believe Amazon wants to customer to have the best buying experience. If you have 1,000 SKUs on your Amazon store but you sell only 5 SKUs, your conversion rate is low and this might get you in the last pages. This is the reason why we started Algopix, which helps eBay & Amazon sellers with sourcing the right products. Use relevant titles with keywords. List your products in the right category. Amazon FBA - if you store your products in an Amazon warehouse you will get promoted. Add videos, this helps a lot. Be genuine!! Your product reviews need to be real, this is extremely important! Try to use a repricer that automatically adapts your price compared to the competition. There are many out there, subscribe for some free trials and see what works for you. Sales volume - if you do these well, you will have sales. Your product rank will improve and it will get you more sales that will generate good reviews. In addition, make sure your selling metrics are great (be very responsive). If you’re a wholesaler, you better make sure you win the Buy Box. As I mentioned before, a repricing software could help here. I am interested in a way of bringing my UK Amazon, FBA and eBay stores together for inventory, listing, orders and communications management. Also it would be great to see how I can expand my offering to the other marketplaces you mentioned such as Rakuten and Walmart. It makes perfect sense that you want everything to be controlled and monitored at the same place. It will save you time and make things easier for you. What you are looking for are Multi-Channel eCommerce Platforms. Luckily, there are many good solutions out there! Channel Advisor, Sellbrite and SolidCommerce are a few of them. I recommend to investigate them thoroughly in terms of values, pricing and reviews. Check the usability and features before you negotiate with them to agree on the approach for your business. Is it worth it to consider selling to Amazon Vendor Canada if our products sell for average of $13.00 given they want a discount and then adding on their costs for 10% co-op, fee, Damage Allowance 2% and freight allowance charge for vendor's 5% = 17% Plus 90 day payment terms, We have orders of 1500 per month. Also exploring Europe What is a discount level for vendors selling into this venue 30% 40% etc. This is a great question, and I’ll answer according to what I believe is right. This is your business and you are the one who needs to make difficult decisions - but I’ll help where I can. First - congrats! Many brand owners wish to be Amazon’s vendors. The fact Amazon wants your products is a great signal. What is the short-term goal? Is it brand awareness or money? How much do you think Amazon will sell? How much time and what cost will it take you to get at the same level? If it’s brand awareness, Amazon will promote your products so, make sure customers get a great experience. From my experience - if you will mention in front of other distributors that you are an Amazon vendor - you have an advantage. If you are short on money and need your cash flow right here right now - it might be a problem. PROS: First - it’s a closed club (luxury). Amazon charges commission but not if you’re a B2B player. It’s easier, you have bigger transactions, you also get consumer trust, Amazon marketing services (such as Amazon Vine Program) and much more. CONS: Smaller customer pool, smaller margins, limited analytics and reporting. Amazon has to approve all changes, usually the turnaround time (purchase orders, shipping, etc) is longer and there is slow payment (like you wrote - 90 days). Bottom line - ask yourself some questions and decide on what you want to focus on now. If you make a decision, give it some time to evaluate thoroughly and be prepared for a small risk.